Alright, let’s face it: not everyone is cut out for the cold that comes with the winter months. 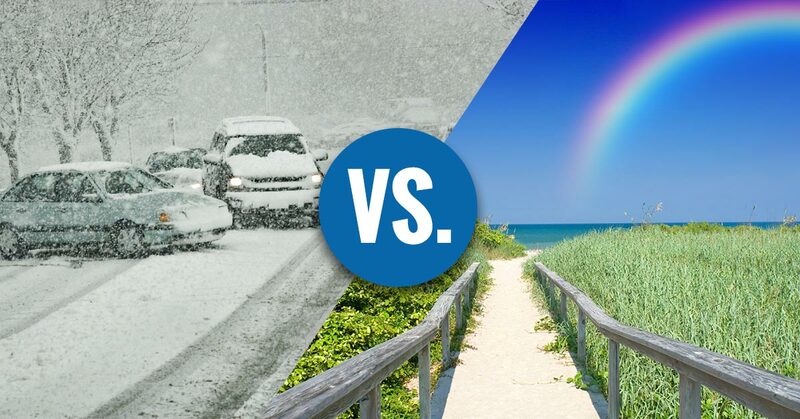 There’s a reason that many find the mild, warm winters of Florida, Texas, or Arizona so appealing, and while you may love spending the winters down south, that’s also not where you want to live year round. Your family lives elsewhere, perhaps along the East Coast or somewhere in the Midwest. Why wouldn’t you want to live near them when the temperatures are reasonable? This lifestyle, much like birds who fly south for the winter, is called snowbirding. This is when you have two homes, one up north and one to the south, so you can always have temperate and enjoyable weather all year round. But one tricky question often comes up with this lifestyle, and that is what do I do about my car? You already have two homes and even several cars, so you have to ask yourself what is the best solution for you in order to sustain your snowbirding lifestyle. Do you keep a car at each home, leaving you to have to maintain two different cars and let one sit for half the year at a time? Do you drive back and forth from place to place, making a road trip twice a year? Or do you choose the third option? What could be hiding behind door number three? When you want to follow the temperate weather, owning multiple cars in multiple homes seems a bit outrageous. Choosing a vehicle transport company to move your car from place to place while you travel quickly and comfortably by plane is the perfect option. When you choose Secure Auto Shipping to transport your car twice a year, you’re choosing the best in security, safety, and professionalism for your vehicle transportation needs. Think about it: when you own a car in each home location, you’re paying extra in car maintenance, car insurance, and in original car cost. This is all money that you don’t need to be paying. Instead, use an affordable and safe carrier to get your car back and forth. Secure Auto Shipping is the carrier of choice for you needs. Simply hop online and fill out our free-quote form in order to know what your expected costs will be. Once you decide that you’re ready to have your car shipped, simply follow the steps found on our website about “How it Works.” We make shipping your car simple and easy. What’s best is that you will know exactly where your car is at all times with real-time notification services. Stop wasting your money on keeping two cars so you can enjoy the right weather and the right location, all during the right time of year. The snowbird lifestyle can be easy to achieve and maintain when you have the right services available to you. Start using the best vehicle transport company each year to keep your car with you! Book your car transport online today with Secure Auto Shipping.